As we head into the Aintree Grand National Weekend, this jockey cam video gives you a great feeling for what those fences are like without the chaos of the race. Ride along with jockey AP McCoy on Hello Bud, an 18-year old chaser. Pretty impressive to be jumping that course at age 18, don’t you think? McCoy won the Grand National in 2010 during his 15th run riding Don’t Push It. AP McCoy (aka Sir Anthony Peter) gives a nice ride. And he should. When McCoy retired in 2015, he had 4,357 winners and had been named champion jockey 20 consecutive times. 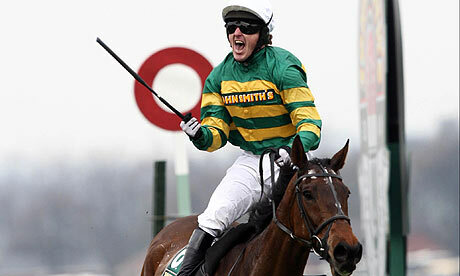 McCoy won the Grand National on his 15th attempt in 2010 riding Don’t Push It. Tune in on Sunday for the 2018 Grand National. If you had $53 million to spend on your horses . . . I watched the documentary on Netflix about AP McCoy “Being AP”. It was interesting. He is certainly a driven individual. But I wouldn’t want to be married to him! I didn’t know about that. Will need to watch it. Thanks!